In response to a lack of public art opportunities during winter, on January 11th, I launched Flex Gallery, a mobile public art space located on my left arm. For the project, I sent canvas armbands to six artists, requesting they turn them into artworks. Each artist works in a wide variety of media, and I provided them with no themes or limitations other than the dimensions of the band. 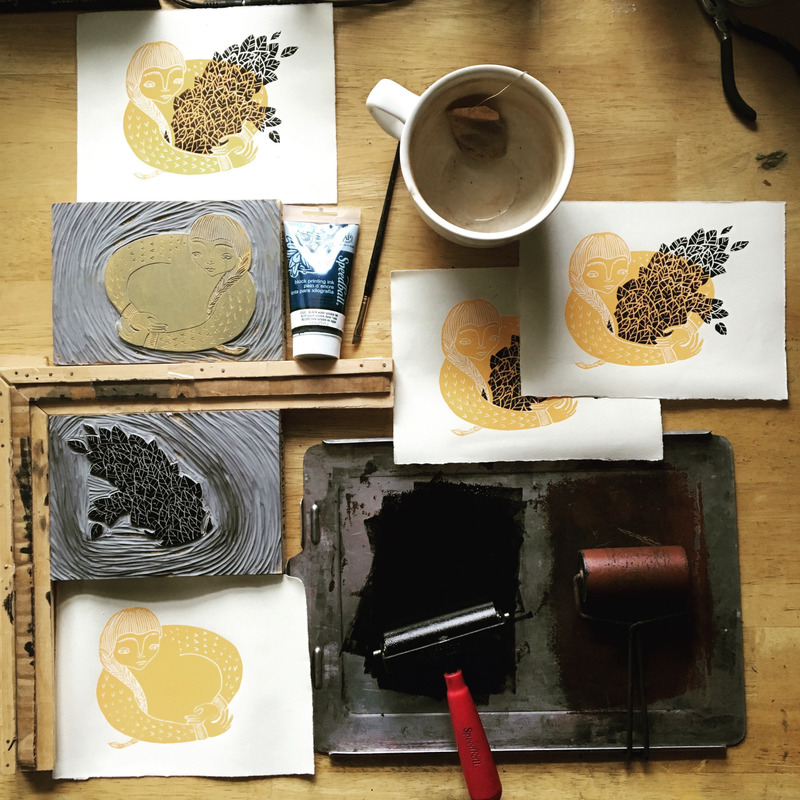 For two weeks last month, I wore the work of Rachel McKay a local printmaking artist. I spoke with her last week to learn more about her work and her creative process. ZJ: How did you first get started making work? RM: I can’t remember a point where I didn’t. Both of my parents…were very encouraging towards creativity; that was a big part of both of their lives growing up. My grandmother was really the biggest influence. She made her entire life through her art. She garnered quite a name for herself in Detroit. She had this awesome group of women that she would create with – something like. “the Four Directions” …it kind of sounded like they could also be a jazz band. They curated shows together, and they would gather and critique each others’ work, and she made her adult life around this very serious view of art…And growing up with that, anytime that I would go visit her, we would spend a long time in her studio and she would teach me whatever she was working on. She would include me, even from a really young age. She would show me how to do monotypes on her printing press, which is now in my studio. I’m really grateful for that. I always wanted to be just like her since I was little – [I’m] still working on it. ZJ: So you basically just kept with it? RM: Yeah. I’ve always been the kind of kid who has thinking hands. Everything that I think and process is with my hands, which translated really naturally to making when I was younger. I would have an idea, and I couldn’t sketch it out, I had to try to figure it out in a tactile way, and that turned into sewing and all these little kids things that got more serious when I got older. ZJ: Are you mostly self-taught then? RM: Yeah. I took whatever classes I could in high school, but outside of that I haven’t really had anything formal. I went to Grand Valley [State University] for photography and studied film photography on that level but no art classes outside of that. Rachel McKay. 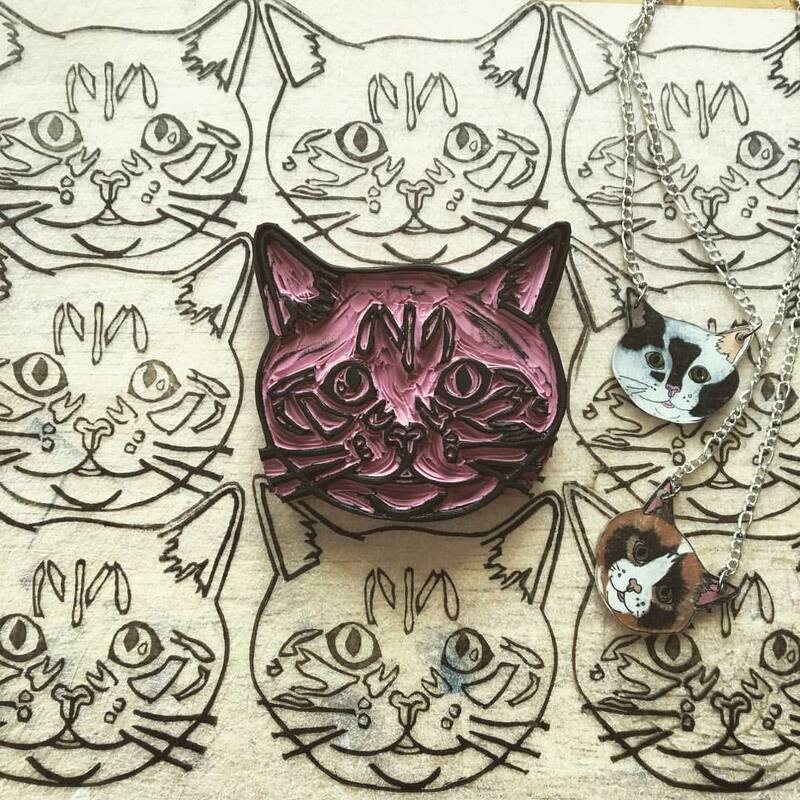 Fat Cat Society, Linoleum stamp, prints, and Shrinky Dink necklaces, 2016. ZJ: What’s your approach to learning new skills? RM: Stubbornness. Once I get it in my head that I want to be able do something, there’s two very distinct parts of myself. One is “we should sit down and research” and there’s “step aside, I’ll figure it out.” The two meet somewhere in the middle. There’s trial and error, but I’m never too frustrated by it. I really enjoy it. Even if the first batch or two of something go hideously wrong, it still feels like I’m learning. It’s exciting; it’s like a puzzle. ZJ: A lot of your work is illustrative or figurative. Where do your visual ideas come from? RM: I’m always influenced by children’s literature. There’s something there that really resonates with me. I spend a lot of time looking at children’s book illustrations, graphic novels, and natural history text books, and those ways of illustrating thoughts, feelings, and emotions. A lot of it is also things that I zoom-in on in my daily life. I did this series called Common Place. I’ve always had a fascination with what hands can do, and what that looks like. So, [in the series] I was looking at everyday things that go unnoticed and wanting to amplify those and make them beautiful. I definitely think about that a lot. A lot of my work is about ordinary things, but I think those things are worth zooming-in on. Because ordinary doesn’t really exist if you get close enough. Rachel McKay. 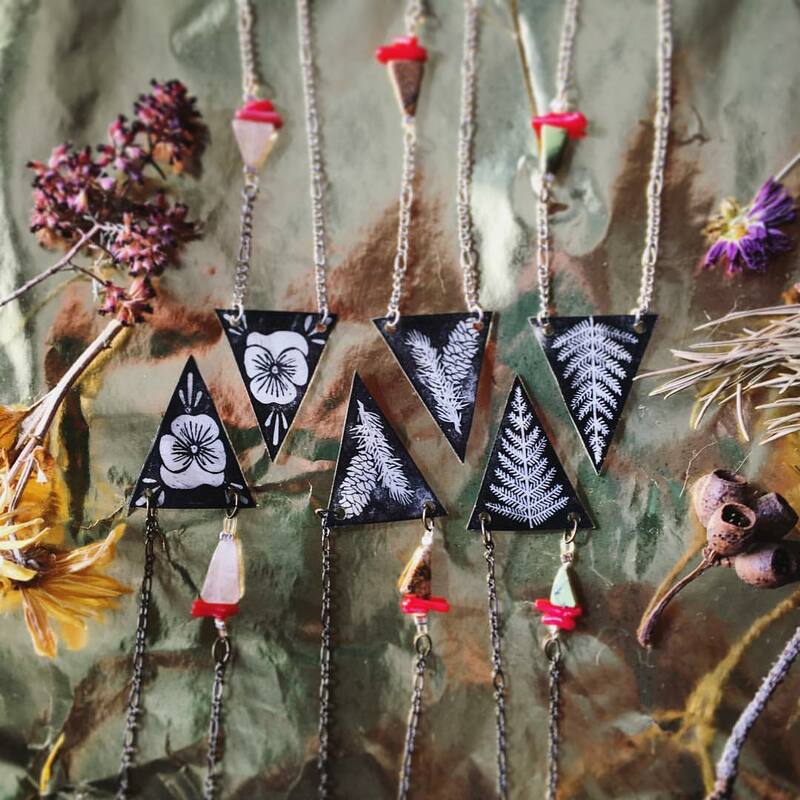 Necklaces (Victorian Herbaria Series). Shrinky Dink and chain, 2016. ZJ: What’s next for you? RM: I really want to buckle down in terms of how I spend my public/selling art life. [I want to] be braver in my choices, applying to things I don’t think I’ll get into, and to things where I think I’ll have an opportunity to grow. A lot of the shows I’ve done in the past I’ve enjoyed, but they’re not exactly where high-paying customers go, and they’re not exactly where I’m going to meet new people or people that will help me move forward in my career. So, I want to be more intentional about that and start applying to things out of state. I also really want to explore zines. They’re not something I expected to fall into, but they’ve been a really expansive world for me. I used to write a lot when I was younger, and I really lost that part of myself until starting to explore zine culture and zine life more. Most of my zines have been very illustrative; I’m starting to add more writing to them. I have so many scatterbrained ideas, and I really want to bring them to a space of unity – something that could be a series. I want to invest time in longer term projects. 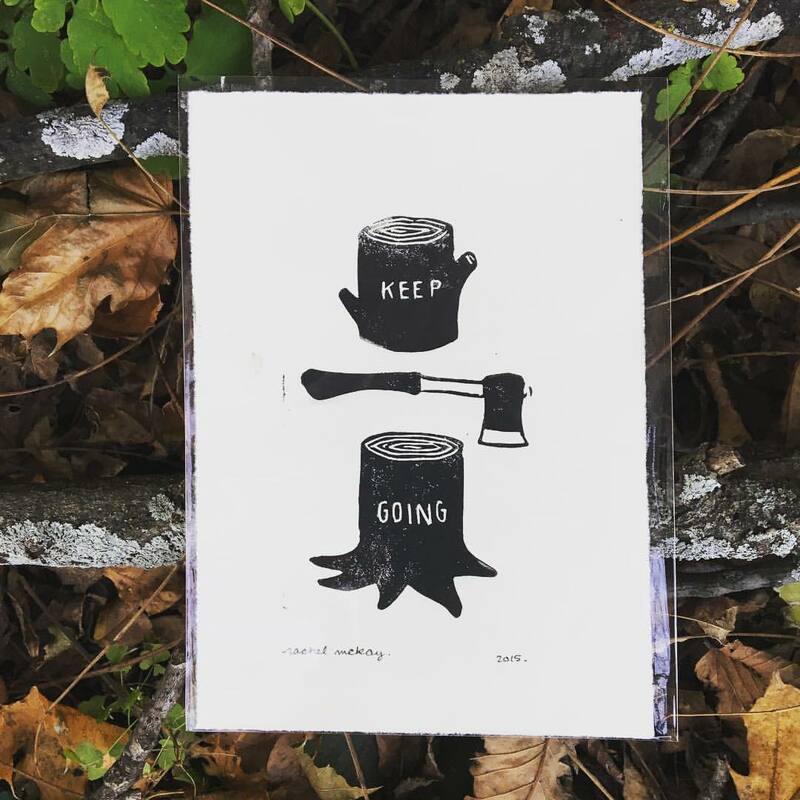 Rachel McKay, Keep Going, Linoleum block print, 2015. ZJ: What was the inspiration behind the armband you created? RM: The whole thing is essentially about memory and loss. This band is about two people who were important to me in different ways. One being my uncle Mike and the other being my grandmother, who, like I said, was…incredibly important to me. She traveled a lot and kept daily diaries, and all of these images are from [her diary] when she visited my uncle in Hawaii. He lived there for most his adult life. And this is right when he was first diagnosed with lymphoma, which he eventually died from. After my grandmother passed, a lot of my family members took one of her notebooks because she had so many. So, I kind of blindly took one without reading it much. This was the first time I sat down with it, and I was really surprised that it was this exact one. When you’re young you don’t think of people that you look up to having fear, of them being terrified and vulnerable and unsure of the future. ZJ: And they don’t let you see that. RM: Exactly. So this was a very heartbreaking read but also confirmed that she had boundless empathy like I knew she did. It hurt on a few levels: her fears about being a parent and the thought of having to someday bury her child – nobody wants that. So, the first layer was a scenery sketch of sugarcane fields. The geometry spoke to me. My grandmother did a lot of mountain painting, so it was cool to see [a sketch] that wasn’t Colorado. The layer directly under that is a sketch she did of my uncle during one of his better days. I liked that it was an imperfect moment. I liked that he has his hand in front of his face, and he looks kind of lost in thought. I don’t know if he sat for her, or if she just sketched this while they were having coffee. I wonder if she just knew her kid so well that it was easy to fill in details, or it was one of the many times where one of her tolerant children sat still for her for hours. ZJ: There’s one more element in the middle layer, the paper inside. I could never read it. RM: It says, “Circle island tour. Mike was either feeling much better or has masked his condition to make sure his dad had a good time.” That one line was the first thing I read when I opened that diary. Mike was sick for so long, it was startling to have that realization that all three of the people in this sentence are gone now, and it’s all of their relationships summed up so well. They were all just people who were thinking of each other first, and I feel like a lot of that’s summed up there. And the [bottom] layer, I intentionally put things over, so there would be something to reveal when the flowers [between the top and middle layer] broke. There’s a quilt covering Mike with one of his feet sticking out. He was famous for his calloused feet, so I saw a spark of him as a person in that one because it’s something that I remembered and something that I could relate to. It was also nice to just see a shabby quilt and some books on a shelf. So, these layers get more personal as they get deeper. In between the two topmost layers there were pressed Queen Anne’s Lace flowers because I wanted to create a veil, something that would intentionally break down. When you lose somebody everything is horrible, but as time goes by and you have more time and space, things really become clear. So I wanted to illustrate that in a physical way where these delicate, fragile flowers were blocking everything behind them, but they broke as you went about your day. They shattered and fell to the bottom, so [one] could see behind them for the first time. [The grieving process] is painful, but everything starts to make more sense and becomes easier to get through. Posts by Zachary Johnson are also available via instagram and tumblr under the name Vis Ed.